As virtually every school-aged child knows, birds are descended from dinosaurs. 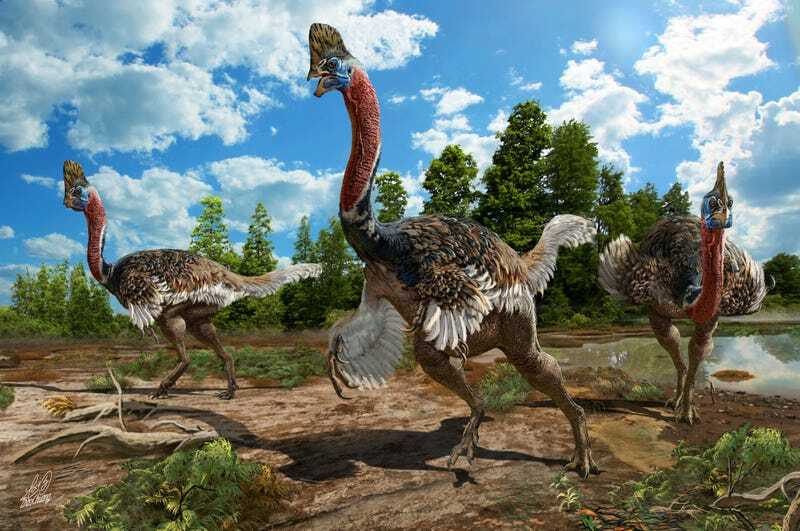 But holy toledo, does this newly discovered oviratporid ever look like a modern cassowary—right from the dramatic crest atop its head through to its long neck and ostrich-like shape. The paleontologists who discovered the dino are now studying modern cassowaries to get a better sense of its potential behavior. This newly-described oviratporid is called Corythoraptor jacobsi, and its fossilized remains—a beautifully preserved and practically complete skeleton—were uncovered near a train station in Ganzhou, Jiangxi Province, in southern China. The discovery of this new species shows that oviraptoridae—a group of bird-like, herbivorous and omnivorous dinosaurs—were among the most prolific and varied group of dinosaurs to live in the arid Ganzhou region during the Late Cretaceous period some 100 to 66 million years ago. The details of this finding were published today in Scientific Reports. Oviraptoridae (not to be confused with oviraptors—that’s a different kind of dino) are known for their toothless, parrot-like beaks, and in some cases, elaborate head crests known as casques. Corythoraptor jacobsi had a particularly pronounced casque that’s remarkably similar to the one found on modern cassowaries, a flightless bird that lives in Queensland, Australia (pictured below). As lead author Junchang Lü from the Chinese Academy of Geological Sciences pointed out in the new study, a comparative analysis of the physical similarities between the two species could shed light on the functional role played by the crest—a possible instance of convergent evolution, where a similar physical characteristic emerges independently in two different species. (Cassowaries may be evolved from dinosaurs, but they acquired these particular traits independently—only very small birds survived the mass extinction that wiped out the dinosaurs). Junchang and his colleagues speculate that the crest served a multi-functional purpose; it may have been used as a display and as a form of communication. It may even have served as an expression of reproductive fitness during mating season, similar to the elaborate feathers found on peacocks. The specimen found in the upper Cretaceous deposits of Ganzhou consisted of a skull, jaw, and nearly complete skeleton. A detailed analysis of this specimen’s anatomy and bone structure suggests it was about eight years old when it died, most likely a young adult who hadn’t yet reached full maturity. It was distinguished from other oviratporid dinosaurs by its pronounced crest, long neck, and the unique skeletal orientation of its vertebrate, among other differences. The researchers say it was closely related to Huanansaurus, a very similar oviratporid dinosaur also from Ganzhou. No traces of feathers were found in the fossil, but previous finds strongly suggest that oviratporids were indeed feathered animals. In recent years, paleontologists working in this region of China have uncovered a trove of oviratporid skeletons, eggs, and clutches (nests containing batches of eggs). Ganzhou is one of the most productive oviratporid regions of the world, and this newly discovered dino now represents the seventh known species to live in the area during this bygone geologic era. “The discovery of Corythoraptor jacobsi provides unprecedented evidence that oviraptorid dinosaurs were morphologically and taxonomically far more diverse in the Ganzhou area than in any other known region of the world,” conclude the authors in the study. Indeed, the researchers say these animals likely lived in mass numbers, possibly even in flocks, preferring dry, desert like habitats. Oviraptoridae fed primarily on the types of tough, low-growing plant life that thrives in arid climates. Dinosaurs may be long gone, but knowing that some of them resembled animals that are still alive today make them seem all the more real.